The Olympus OM system is a series of cameras, lenses, and accessories introduced by Olympus in 1972. The OM system was designed by Maitani Yoshihisa, who halved the weight of the professional SLR camera body with few compromises in reliability or versatility. The very first bodies, launched in 1972, were called M-1. These were later renamed to OM-1 following a dispute about the name with Leitz who had an existing M series of cameras. The OM-1 has been a favorite of astronomers and others in scientific fields for decades. Its light weight, manual operation and mirror lock-up make it ideal for attaching to telescopes and microscopes. The OM system also became a favorite of all those for whom weight without optical compromise was a primary consideration. OMs have been around the world with some of the National Geographic photographers convinced enough to give up their Canons or Nikons, they have also been to the top of Everest with climber Chris Bonington. Professional photographers David Bailey and Lord Lichfield also used to be associated with the OM system (see other examples here). The OM system continued to develop with advanced electronics for sophisticated metering systems and program modes, with Olympus being the inventor of off-the-film light metering (on the OM-2), sophisticated TTL flash systems, high-key, low-key and multiple spot metering (on the OM-4) and the invention of high-speed sync flash (on the OM-707). However, when the autofocus revolution hit in the late 80s Olympus was late to the market and with a very unsophisticated non-system camera. Manual focus OMs continued to be sold until the end of the century and they still have a faithful following among enthusiasts today — Olympus have even released an adaptor for the digital Four-Thirds system that allows the use of OM lenses on the new DSLR bodies. During the design periods, Olympus had studied a completely modular camera, like a 35mm Hasselblad, built in prototype form as the OM-X. You can find some details and pictures here. Following the failure of the OM System to adapt to the autofocus revolution, Olympus turned its attentions elsewhere — to compact cameras and the IS series of fixed lens SLRs. Recently, Olympus have designed and released a new camera system onto the market: the 'designed for digital' Four-Thirds System. The double-digit 'amateur' line of cameras featured smaller, fixed viewfinders, generally slower top shutter speeds and lacked connections for off-camera flashes. They were also made from cheaper components and their moving parts were not rated for as many activations. 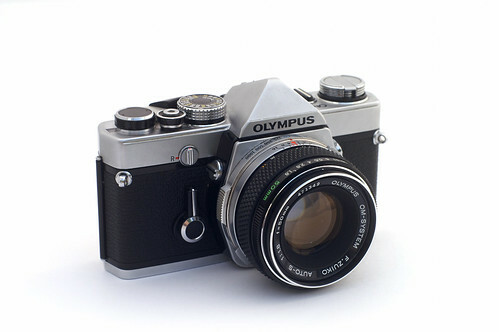 Later in the life of the system Olympus introduced two automatic models — the OM-707 (1986 to 1991) and OM-101 (1988 to 1991) which sold poorly, trailed the market somewhat in feature set, and lacked functionality with most of the OM System components. Still later the OM-2000 (1997 to 2002) was a cheaper body manufactured by Cosina that could accept the OM lenses, but again did not support OM system components, other than most of the lenses. Pro (Single-digit) bodies marked in lighter blue. The Olympus OM system comprised the OM bodies (the top range OM-1/2/3/4 and the mid range OM-10/20/30/40), the OM lenses and many accessories covering everything from astrophotography to microphotography. For that reason the OM system has been used for many years, and is still used by astro or macro photographers. Olympus had arranged them in groups as per below. A large range of interchangeable lenses was developed for the OM system over a period of thirty years; see Olympus OM lenses for further details. All 'T' Series flashed support TTL automation with compatible OM bodies (OM2 and variants, OM-4, OM-4Ti, OM-3Ti, OM-40, OM-707, OM-101). The number in the 'T' series flash unit names correspond to their guide number at ISO 100. T20 — Coverage equivalent to a 35mm lens. Takes 2× AA batteries. T45 — Coverage equivalent to a 24mm lens, features a tilting (0° to 90°) and swivelling (340°) head. Powered by an external battery pack, this is a large, vertical grip-style flash unit with almost hemi-spherical coverage. F280 Full-Synchro Flash — Coverage equivalent to a 24mm lens, takes 4× AA batteries. Guide number of 28. The first flash in the world to feature full-synchro with all shutter speeds. This 'Super FP' mode works with the OM-707, OM-4Ti and OM-3Ti up to shutter speeds of 1/2000 sec. S20 — Coverage equivalent to a 35mm lens. Takes 2× AA batteries. Non-system flash with no TTL automation; slightly cooler colour (= higher light temperature) than all system flashes (5900K). Released alongside the OM-2000. T8 Macro Ring Flash 2 — Reflected-light ring flash with interchangeable reflectors. Suitable for macro photography. T28 Macro Flashes — Single or twin head flash system that mounts around the front lens element allowing limitless rotation, angle and tilt positioning. T32 Zoom Adaptor — Clips on to the front of the flash head and increases the flashes guide number at longer focal lengths. Features positions for 50mm (guide number 36), 75mm (guide number 38), 100mm (guide number 40) and 135mm (guide number 42) lenses. T32 Wide Adapter/ND Filter Set — Clips on to the front of the flash head and gives coverage equal to a 21mm lens. Also features a set of neutral density filters to reduce flash guide number to 11 or 16 while maintaining TTL auto functionality. T32 Colour Filter Set — A set of coloured filters that clip on to the front of the flash head. F280 Wide Adaptor — Gives the F280 Full-Synchro flash coverage equal to a 21mm lens, and decreases the guide number to 19. The Flash Group also features a range of hot-shoes and TTL connectors (swappable between OM-1 and OM-2 bodies) and various accessories to enable complex and creative flash set-ups. Accessory Shoe 2 — Only for OM-2. Offers TTL automation with Quick Auto 310 flash. Accessory Shoe 3 — Only for OM-2. Offers TTL automation with 'T' series flashes. TTL Auto Connector Type 3 — Mounted on an OM-2 body this allows direct connection for a TTL cable for off-camera flash use. TTL Auto Connector Type 4 — Mounted on OM-1n or OM-2n bodies this allows direct connection of TTL cables for off-camera flash use. Also shows LED flash indicator in viewfinder. TTL Auto Multi Connector — Allows connection of multiple T series flash units in TTL auto mode. These units can be 'piggy-backed' to control up to 9 flash units at once. Remote Sensor — Used to control Quick Auto 310 flash with the Bounce Grip when in "normal TTL" mode with OM-1 or OM-2. Flash Extender — Can be mounted between a T18, T20 or T32 flash and the camera to raise the flash 8smm further above the camera body, reducing the effect of 'red eye' in portraits. Macro Flash Shoe Ring — The lens mount for the T28 Macro Flashes. Various cables and cords were also released to connect all these units together. Various power sources were released to increase flash power and recycle times. T Power Control — Power unit for the T8, T10 and T28 Macro Flashes. Bounce Grip — A camera grip that allows for tilt but no swivel functions with the Quick Auto 310 flash. Only to be used at the left side of the camera body. Uses four 'C' cell batteries to improve recycle time with the flash unit. Power Bounce Grip 2 — A camera grip that allows tilt and swivel TTL automation with the T series flashes. Uses four 'C' cell batteries to improve recycle time with the flash unit, and has a shutter release that can be connected to Motor drive or Winder units (with correct cables attached). 315v Power Pack — A large shoulder-mounted battery pack that can be used to greatly increase the life and decrease the recycling of the Quick Auto 310 flash. Motor Drive 1 — Up to 5fps; compatible with all single and double digit OM bodies except the OM-10. Motor Drive 2 — Up to 5fps; allows motorized rewind with the OM-3 and OM-4; compatible with all single and double digit OM bodies except the OM-10. Winder 1 — Single frame advancement only; compatible with all single and double digit OM bodies. 250 Film Back 1 — compatible with all single digit OM bodies. 250 Film Back Magazine — compatible with all single digit OM bodies. 250 Film Back Loader — Provides easy solution for loading bulk film strips onto 250 film back. Olympus released a total of 17 different focusing screens for the single-digit OM bodies. Not all screens are usable on all bodies, nor were many of the screens compatible with all available lenses. The screens are inserted through the front of the body, ensuring the pentraprism assembly is left sealed. The screens were sold in rigid plastic cases, containing a small of tweezer-style tool for insertion/removal. Standard focusing screen featuring a small central microprism spot on a matte ground. Focusing is carried out by ensuring all portions of the divided image inside the microprism line up. The matte background also allows focusing to be made over whole frame. Suitable for all lenses, but lenses with maximum apertures greater than f5.6 may cause darkening of the microprism section. While essentially similar to screen 1-1 this version is designed for use with telephoto lenses, meaning the microprism will not darken unless lenses with maximum apertures greater than f8 are used. General purpose screen, allowing focus to be made by aligning the two split images in the central section. Use of lenses with maximum apertures greater than f5.6 may cause darkening of the split-image section, though the matte background allows focusing to be made over the whole frame. Both 1-4 and 1-4n feature all matte screens, allowing focusing to be made across the entire frame. 1-4 has a large circle engraved across the central section of the frame, which roughly approximates the area used by the centre-weighted metering system. Type 1-4n features a much smaller circle — approximately 2% of the frame — to indicate the metering circle used by OM bodies with spot metering functionality (OM-2s, OM-3Ti, OM-4Ti). Designed for wide-angle and standard lenses, the transparent screen provides a very bright image — however, focusing can only be made by using the microprism section due to the nature of the clear field. Does not provide correct meter readings in manual mode with OM-1n or OM-2n. Only compatible with selected lenses. Transparent screen with microprism centre, this lens is similar to type 1-5, but works with selected standard and telephoto lenses. Does not provide correct meter readings in manual mode with OM-1n or OM-2n. As per types 1-5 and 1-6 this is a clear field-type finder with microprism centre. Does not provide correct meter readings in manual mode with OM-1n or OM-2n. Only compatible with selected super telephoto lenses. Extremely fine matte ground, giving fine focal depth control across the entire frame. Only compatible with selected super telephoto lenses and astronomical telescopes. Designed for use only with an endoscope; features a large convex central region. Type 1-10 Checker-Matte Type — for tilt-shift photography. All matte ground screen as per type 1-4, this screen is marked with grid lines for alignment in architectural photography. Suitable for all lenses and general photography use. Finely ground matte field for focusing in close-up situations, and cross-hairs type macro focusing aids. Compatible only with macro lenses. Clear field screen only enabling focusing by use of the cross-hairs aid. Designed for 'greater than life size' photography. Compatible only with selected macro lenses. Featuring a matte screen allowing full-frame focusing along with a split image rangefinder and microprism surround, this lens allows pinpoint accuracy with three focus aids. Suitable for all lenses, but lenses with maximum apertures greater than f5.6 may cause darkening of the microprism section. As per type 1-13, but with split image rangefinder titled at a 45° angle to aid focusing on vertical or horizontal lines. Suitable for all lenses, but lenses with maximum apertures greater than f5.6 may cause darkening of the microprism section. Very fine all-matte ground allowing full field focusing with very bright viewfinder. Compatible with all lens types. Not compatible with OM-1 or OM-2 bodies (other than the OM-2S). Very fine, very bright matte screen allowing full-frame focusing as well as a split image rangefinder and microprism surround, this lens allows pinpoint accuracy with three focus aids. Suitable for all lenses, but lenses with maximum apertures greater than f5.6 may cause darkening of the microprism section. Not compatible with OM-1 or OM-2 bodies (other than the OM-2S). Also covered by the Finder Group were various attachments for improving the viewfinder usage. Eyecup 1 — A round rubber eyeshade that fits over the rear finder window to cut out stray light. The rubber eyecup can be removed to allow for dioptric correction lenses to be fitted, allowing users with visual impairments to see a clear image. Eyecup 2 — A large rectangular eyeshade that fits over the rear finder window to cut out stray light. The eyecup can be removed to allow for dioptric correction lenses to be fitted. Varimagni Finder — A right-angle finder attachment which allows 360° degree rotation to view from any angle. The Varimagni Finder also magnifies the finder image 1.2 or 2.5 times to allow greater focal precision. Eyecoupler — A small adapter to enable the use of the Varimagni Finder with focusing screen Type 1-12 for microphotography. ↑ The name is given in the Japanese order, with family name followed by the given name. Maitani Yoshihisa and the cult of Olympus at Classic Cameras by RaúlM. This page was last edited on 19 January 2016, at 11:42.